” City of four million pagodas “. Although Burma was at times divided into independent states, a series of monarchs attempted to establish their absolute rule, with varying degrees of success. Eventually, an expansionist British Government took advantage of Burma’s political instability. After three Anglo-Burmese wars over a period of 60 years, the British completed their colonization of the country in 1886, Burma was immediately annexed as a province of British India, and the British began to permeate the ancient Burmese culture with foreign elements. 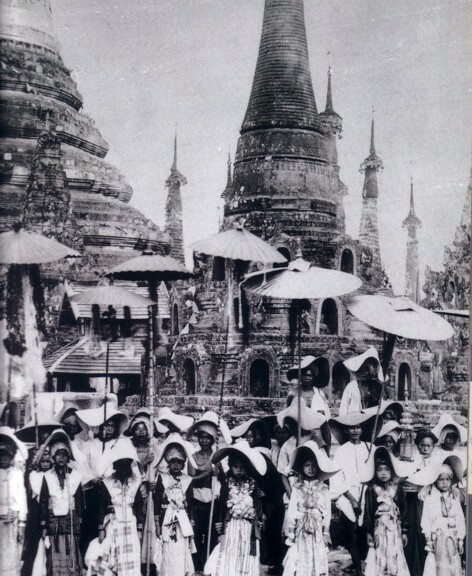 Burmese customs were often weakened by the imposition of British traditions. The British also further divided the numerous ethnic minorities by favouring some groups, such as the Karen, for positions in the military and in local rural administrations. 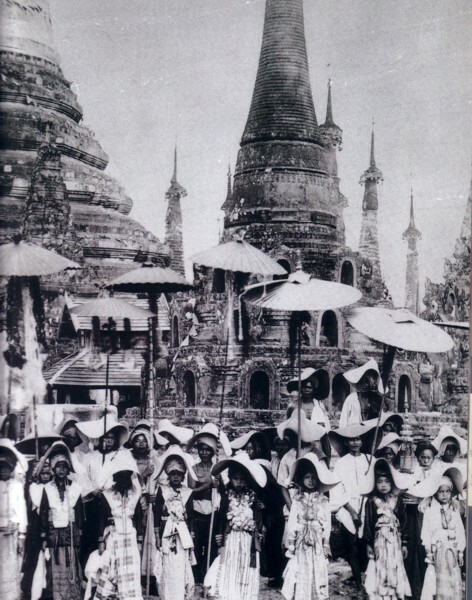 During the 1920s, the first protests by Burma’s intelligentsia and Buddhist monks were launched against British rule. By 1935, the Students Union at Rangoon University was at the forefront of what would evolve into an active and powerful movement for national independence. A young law student Aung San, executive-committee member and magazine editor for the Students Union, emerged as the potential new leader of the national movement. In the years that followed, he successfully organized a series of student strikes at the university, gaining the support of the nation. At the outbreak of the Second World War, Aung San seized the opportunity to bring about Burmese independence. He and 29 others, known as the Thirty Comrades, left Burma to undergo military training in Japan. In 1941, they fought alongside the Japanese who invaded Burma. The Japanese promised Aung San that if the British were defeated, they would grant Burma her freedom. When it became clear that the Japanese would not follow through with their promise, Aung San quickly negotiated an agreement with the British to help them defeat the Japanese. 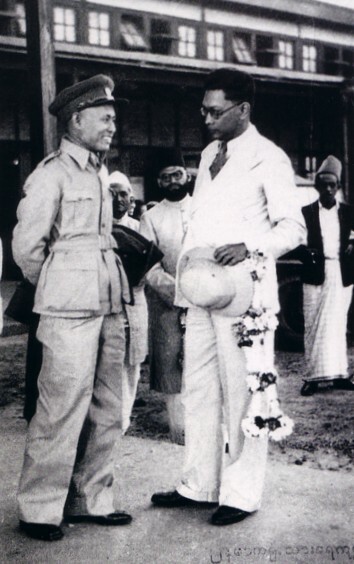 Hailed as the architect of Burma’s new-found independence by the majority of Burmese, Aung San was able to negotiate an agreement in January 1947 with the British, under which Burma would be granted total independence from Britain. Although a controversial figure to some ethnic minorities, he also had regular meetings with ethnic leaders throughout Burma in an effort to create reconciliation and unity for all Burmese. As the new leader drafted a constitution with his party’s ministers in July 1947, the course of Burmese history was dramatically and tragically altered. Aung San and members of his newly-formed cabinet were assasinated when an opposition group with machine guns burst into the room. 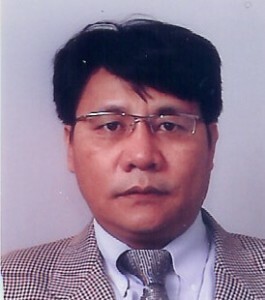 A member of Aung San’s cabinet, U Nu, was delegated to fill the position suddenly left vacant by Aung San’s death. A Burma was finally granted independence on January 4, 1948, at 4:20am – a moment selected most auspicious by an astrologer. For the next ten years, Burma’s fledging democratic government was continuously challenged by communist and ethnic groups who felt under-represented in the 1948 constitution. Periods of intense civil war destabilized the nation. Although the constitution declared that minority states could be granted some level of independence in ten years, their long-awaited day of autonomy never arrived. As the economy floundered, U Nu was removed from office in 1958 by a caretaker government led by General Ne Win, one of Aung San’s fellow thakins. 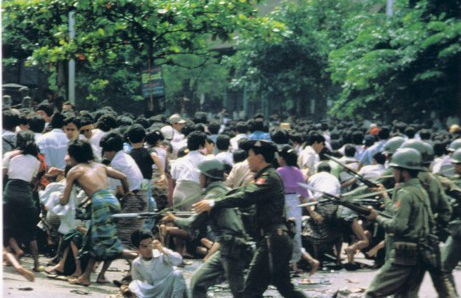 In order to “restore law and order” to Burma, Ne Win took control of the whole country including the minority states, forcing them to remain under the jurisdiction of the central government. Although he allowed U Nu to be re-elected Prime Minister in 1960, two years later he staged a coup and solidified his position as Burma’s military dictator. and ethnic-minority rebel groups. The country was closed off from the outside world as the new despot promoted an isolation ideology based on what he called the Burmese Way to Socialism. Superstitious, xenophobic and ruthless, for the next three decades Ne Win set a thriving nation on a disatrious path of cultural, environmental and economic ruin. Outside visitors were few and restricted to Rangoon, Mandalay and a handful of other tightly controlled towns close to the central plains. Insurgency remained endemic and in many areas of Burma armed struggle became a way of life. 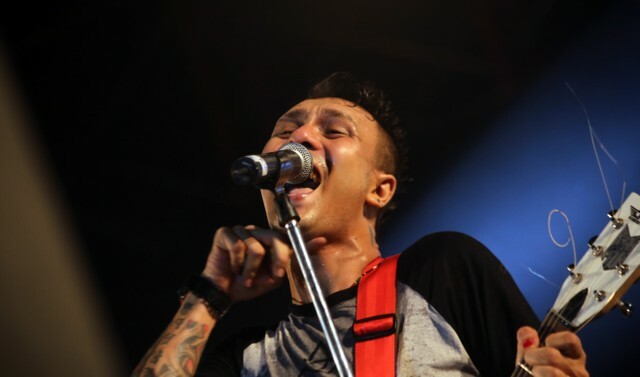 In July 1988 Ne Win suddenly announced that he was preparing to leave the stage. 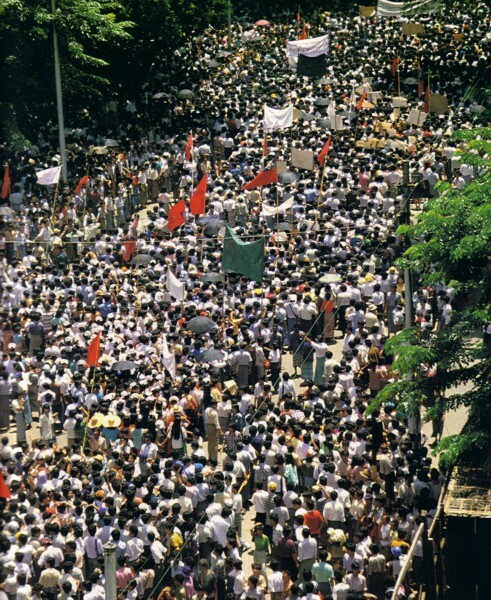 Seeing at last a possible escape from military rule, economic decline and routine human rights abuses, thousands of people took to the streets of Rangoon. It just so happened that during this time of unrest in 1988, Aung San Suu Kyi, daughter of independence hero Aung San, who had been living abroad, returned to Burma to care for her ailing mother. Her devotion kept her there and brought her into the political foray. 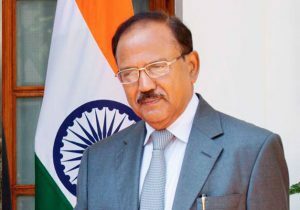 Attempting to quell international condemnation for its violence, the military announced it would hold multi-party elections. Under the persuasion of students and others opposed to the regime, Aung San Suu Kyi and like-minded colleagues founded the National League for Democracy (NLD). Her party quickly gathered country-wide support. Just when democratic changes seemed imminent Ne Win commandeered the army from behind the scenes to take over the country in a staged “coup”. On September 18, 1988, control of the country was handed to a 19-member State Law and Order Restoration Council (SLORC) and a vicious crackdown followed. 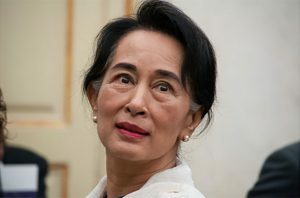 Although committed to non-violence, Aung San Suu Kyi was placed under house arrest in July 1989 for “endangering the state” and kept there for the next six years. Desperate to improve their image and generate foreign investment, the SLORC went ahead on May 27, 1990 and held the multi-party elections they had promised. Despite the SLORC’s severe repression against members of opposition parties (Aung San Suu Kyi was kept under house arrest) and the complete lack of freedom of expression throughout the country, Suu Kyi’s NLD party swept to victory with 82% of the vote. Surprised and outraged, the SLORC refused to acknowledge the election results and has retained its repressive grip on power ever since. Eventhough Daw Aung San Suu Kyi was released from house arrest in May of 2002 the military has refused to relinquish power. The generals have not engaged in any sort of dialogue. The humanitarian situation in Burma is disasterous and civil war still ravages the border areas. The effect of military rule has been a severly impoverished and underdevelopmed nation, Burma has rated as the second least developed nation on the United Nations Development Index. Peace, democracy and the most basic human rights do not exist. Millions have been forced to flee due to military rule and are scattered all over the world longing for the day when they can return to their homeland and be re-united with the families and live in peace. Oddly anglicized to ‘Rangoon’ under British rule, Yangon is one of the great unsung cities of the world, and certainly the friendliest! The ‘Garden City of the East” is most famously known as the home of Myanmar’s holy of holy’s – the 2,500 year old Shwedagon Pagoda. At 325-feet in height & covered in 60 tons of gold, Shwedagon’s shimmering glory dominates the city skyline. Although Yangon is much more than Shwedagon. There are a host of fine exotic hotels and restaurants, a burgeoning arts scene, rare antiques shops, fascinating markets, and even the night life is surging with new energy, Yangon is truly an urban experience quite unlike anywhere else. 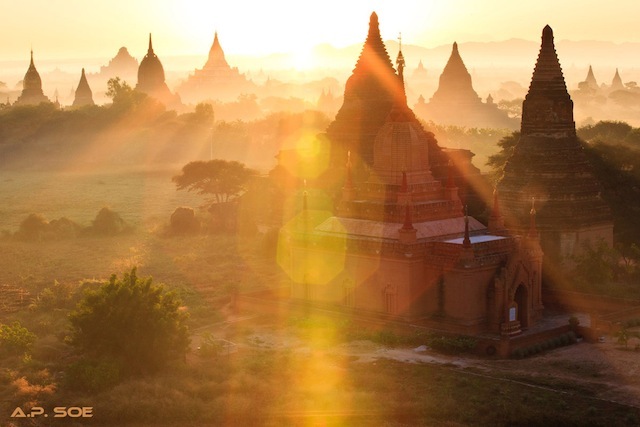 The vast Buddhist temple-scape of Bagan, a legacy of devotion and monuments to power built by the Pagan Kings over several centuries, is not only a place of surreal wonder, but is without a doubt one of the greatest archaeological sites on earth. The 2,220 surviving temples (13,000 at its apex) can for the most part be explored quite freely. Modes of transport around the 40 square mile temple zone, include bus, car, bicycle, foot and hot air balloon! Don’t believe what your read on certain travel review sites. Sure, the city is a dusty trading hub, but there is much more to it than meets the average tourist’s eye. On his photo tours, National Geographic‘s Steve McCurry spends more time here than anyplace else. The Mandalay Array, as Luminous Journeys has dubbed it, is culturally and photographically rich indeed. Highlights include Myanmar’s 2nd holiest shrine, the Maha Muni gilded Buddha, the picturesque U Bein Bridge (the largest teak structure on earth), the massive, never completed temple of Mingun, the 600 monasteries and nunneries of the Holy Hills of Sagaing, and a whole lot more. Mandalay – as dusty as it may be – should not be overlooked. One of the most popular and beautiful places to visit in Myanmar, Lake Inle is best known for its unique fishermen, who row their dugout canoes standing with a single leg wrapped around a single oar. Despite the rise in tourism and the changing waterscape of expanding ‘floating gardens’, (the lake provides 70% of Myanmar’s tomatoes), Inle, with its wonderful water bungalow hotels and welcoming people, still maintains its palpable, yet indescribable magic. Located about f ive hours by road from Yangon, The Golden Rock is Myanmar’s 3rd holiest shrine, behind Shwedagon Pagoda and the Maha Muni Buddha. The true history of this gilded wonder resting precariously on the precipice of a mountain outcrop, is as shrouded in mystery as Myanmar itself. Legend has it that what keeps it from tumbling a thousand feet into the gorge below, is a single hair of the Buddha! Mrauk U was the seat of power of the Arakan Empire that ruled vast coastal regions of western Myanmar and into India as far as the Ganges River. At its height the city was as wealthy, diverse and influential in the East as Amsterdam was contemporaneously in the West. The Arakan kings thought enough of their own well being to enlist Japanese Samurai as personal body guards! 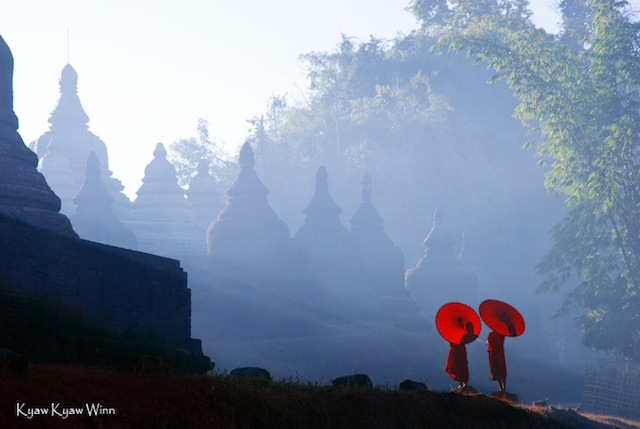 Mrauk U today, with its great temple fortresses serving as little more than exotic backdrops for a collection of small rural villages, has a surreal feel to it, especially when shrouded in morning mist. That the only access is by river adds even more of an adventure feel of visiting this lost dynastic capital. While well trodden Thailand has seen its tribal areas become over-touristed, this is far from the case in Myanmar. It is still quite possible to visit villages who very rarely, if ever, see foreigners, and some tribes are unique to Myanmar. It should be noted that during high season these days, the easier to reach villages will be expecting you! So, if you are looking to get seriously authentic, plan well, and make sure you have a guide who understands what you’re after. 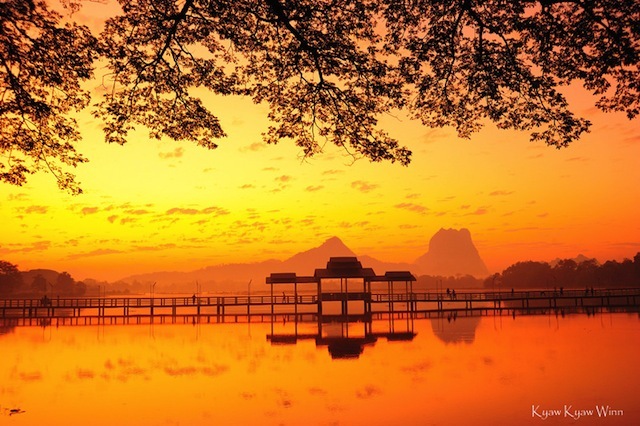 Hpa An is the photogenic capital of Kayin State on the Thanlwin River. About a 7-hour drive southeast from Yangon, the town is surrounded by Karst mountains and is great place for short, scenic treks. Outside of town there are seas of green rice paddies backed by Karst rock formations. Mt. Zwegabin is the most prominent “rock”, and can be climbed in a couple of fairly strenuous hours, but the views are a spectacular reward. The biggest draw of Hpa An for many, are the limestone caves in that serve as amazing natural Buddhist temple shrines. The Myanmar Himalaya is virtually virgin territory, at least as far as foreign visitors go. The region is one of most bio-unique in the world, with an average of 30 to 40 new species of flora and fauna discovered each year. 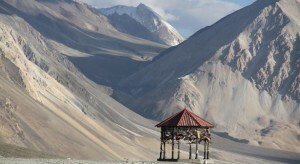 Putao is the gateway to Himalayan trekking for true adventure types, and is reachable only by air. 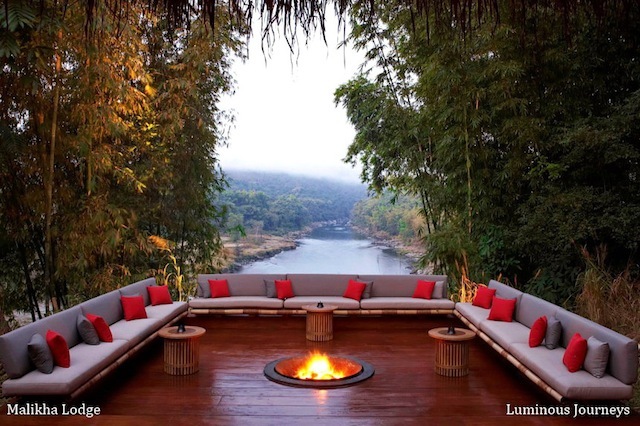 For the luxury minded, river rafting, short treks and bike jaunts are all available from the beautiful Malikha Lodge. Nothing like a delicious cocktail and a massage after a long day exploring. Ngapali is more than Myanmar’s most visited beach. Yes, it’s a lovely tropical beach on the Bay of Bengal, with requisite white sands, swaying palms, sashay masseuses and beachfront bungalows, but what really puts it over the top, is the spectacular seafood. Most of Myanmar’s sea gastronomy chefs are gathered here, all vying to win the affections of your taste bud arrays. Next you should head to Ngwe Saung. What this up and coming budget to luxury resort area has over Ngapali, is that it’s nine miles longer, has more locals than foreigners and is within driving distance of Yangon. The lacquer takes its roots in China it there has a few three thousand years, and then developed in all the Southeast Asia. In Myanmar the tree which one takes the resin is it Thit-si. These trees push naturally in whole forests almost in all Myanmar in light altitude. One takes the resin, a little like one does it with latex, by notches at the base of the trunk on which one fixes small bowls in bamboo. The sap of the lacquer tree has a very strong adhesive quality and a splendid brilliance. It has many qualities as to make impermeable the objects which it covers. It adheres on many surfaces, bamboo, woods, sheets of palm tree, metal and leather. It resists the insects and guards on all occasions its flexibility. 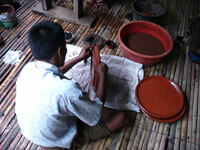 In Myanmar, the origins of the lacquer seems to come from Bagan about 12th – 13th century. One of the oldest lacquers was indeed discovered in the pagoda Mingalazedi, one of the built last with Bagan (at the 13th century). Always it is that it is in Bagan that the manufacture of the lacquers acquired its letters of nobility. 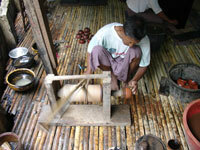 The raw material used to manufacture the objects is the bamboo. 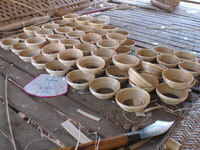 The bamboos used to make the inner part of the lacquerware come from the forests of the Chin State and which is transported by boat until Bagan. The bamboo then is cut out, softened, worked to give the shape of the desired object: bowls, dishes, vases, cuts, plates, various boxes, most famous being the box for betel leaves and nuts. The craftsman draws up the bamboo on forms. In certain cases one uses also the hair of horse. the regularity. The craftsmen who carry out this work used this technique since generations and generations. 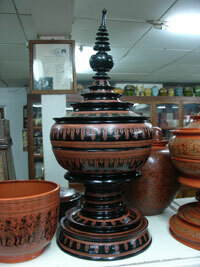 Most of the lacquerware makers are families working on this from generation to generation. When an application is made on the mould in bamboo, one must then dry it in an obscure and wet place. The duration of drying is of approximately a week. All the workshops of lacquer have thus places corresponding to necessary qualities where they store the lacquers in manufacture. If the moisture is not sufficient, then good quality lacqureware will not be produced. Once finished drying, the lacquers carefully are washed and sandpapered if necessary. This stage is important for the quality of the future lacquer. This washing and sandpapering is carried out some time with charcoal, resulting from very widespread trees in Myanmar like teak. After the first drying, one carefully sandpapers the object, one washes it, then one passes by again, the second layer and one turns over to drying. 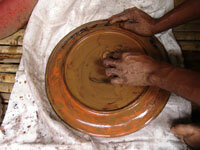 As one passes by again of the layers, the mixture is increasingly fine, one uses ash of ox bone. When the new layer was well spread out, one erases the possible finger marks with a fine fabric. The object thus makes several outward journey and return with the warehouse of drying. Each time it thus receives a new layer of lacquer. It is only on the last layer that one colours. The colors are usually red, green, blue or yellow. 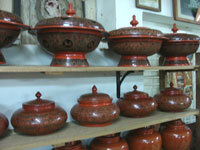 The color is obtained by adding powder of mercury cinnabar to the lacquer. This mixture is called Hinthabada. After last drying for the 7th or 8th times, the lacquer is again sandpapered with teak wood ash, then washed carefully and it then will be decorated. Engraving is done with free hands, without model, entirely of memory, directly with naked hands, using a stylet and of a brush. The lacquer is inalterable, and the objects in lacquer can preserve all their beauty during years. Not only are the small objects enameled, utensils of crockery, or another objects of worship, but also of the pieces of furniture, the cupboards, the tables, large decorative objects, the musical instruments, earthenware jars etc… are being decorated with beautiful colors. 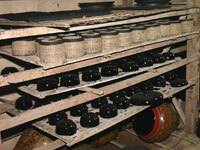 After carrying out all theses processes, the lacquerware are now marketable throughout the country and to overseas. 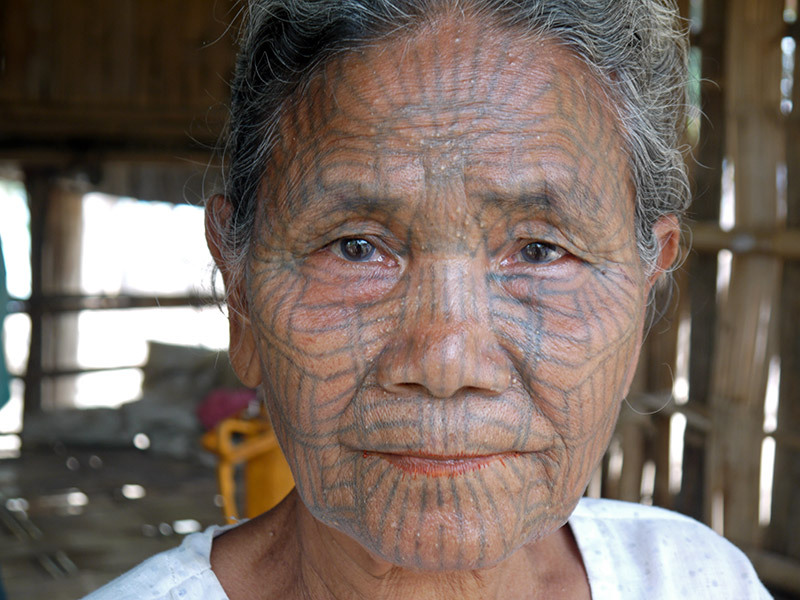 The Chin tribes of Myanmar, near the Bangladesh border and Mrauk U, are most notable for the intricate ink detail covering their faces. 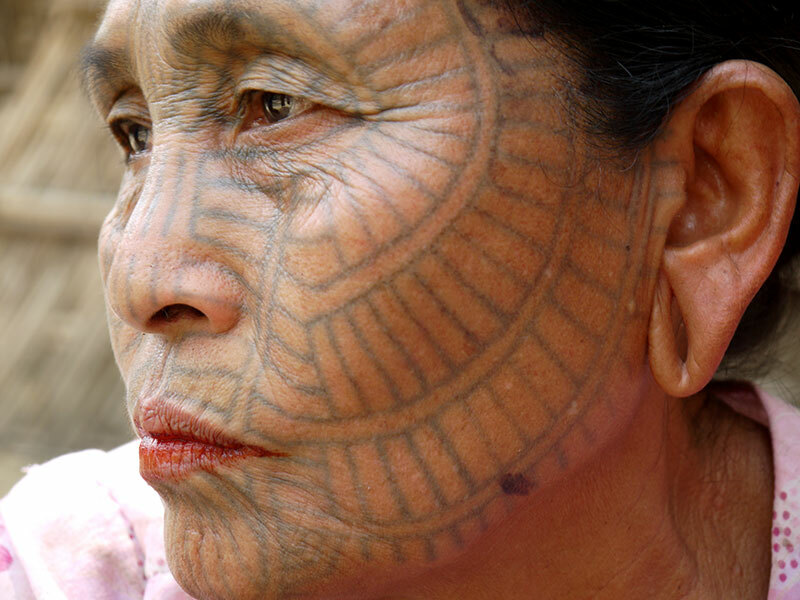 These are a people of facial tattoos, and I journeyed to this corner of Asia in an attempt to discover why exactly they undergo such a process, which seems extreme in Western culture. (Watch the video below to hear their answers firsthand). 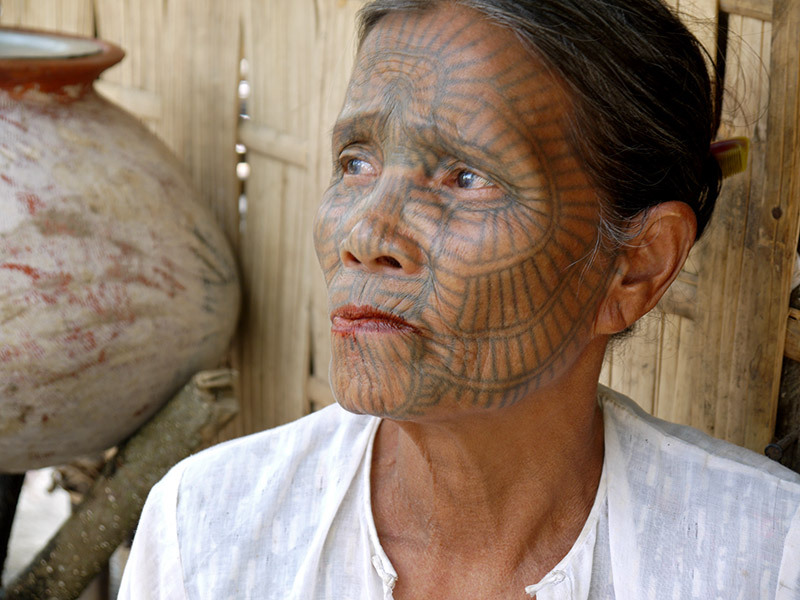 A Chin woman with distinctive facial tattoos. I traveled to the remote tribal villages of the Chin State, which would normally require an arduous seven-hour overland journey from Bagan to Mindat — with very poor accommodation options along the way. However, an easier route into the tattooed world of Chin women exists, if you consider using the ancient kingdom of Mrauk U in Rakhine State as a base. It’s about 3.5 hours up river from Mrauk U and its eerie, endless and spectacular temples. 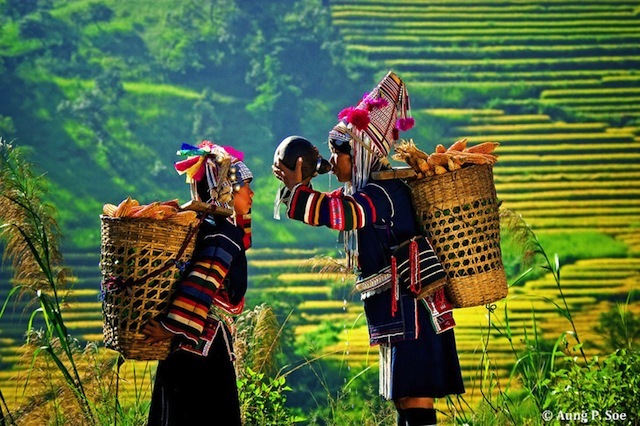 Here, the population are primarily Chin, being located near the border with Southern Chin State. This experience can be done as a day trip, so travelers would be returning in the late afternoon to the comfort of the Princess Resort. 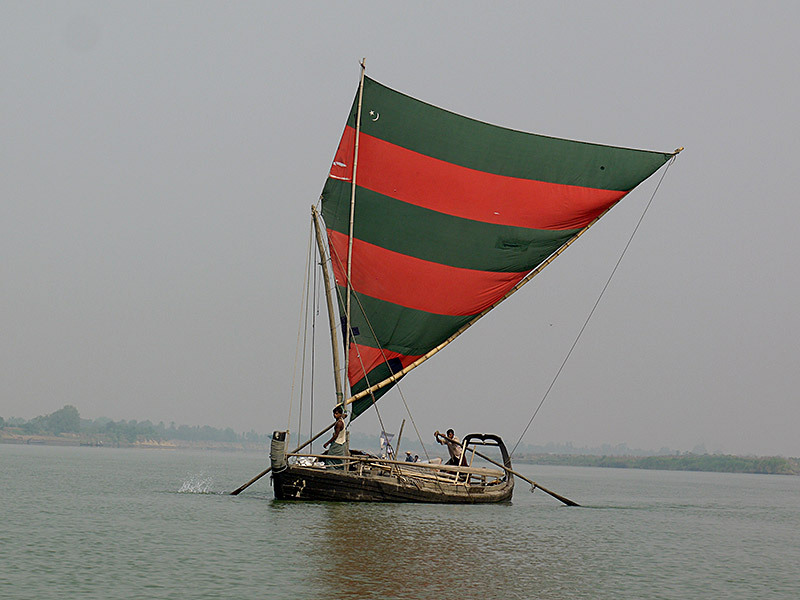 Traditional sailboat on the Kaladan River. To get to Mrauk U, you can fly from Yangon to Sittwe, an area that is 40 percent Muslim — then take a four- hour boat ride up the Kaladan River. I woke up early and drove to the Lay Myo River, where I took a small local boat upriver towards my destination. As we floated along, I gazed at villages of fishermen and farmers and many traditional sail boats, most of them Muslim people living in Myanmar since British colonial days. A friendly Chin woman that invited us into her home. We eventually reached the first Chin tribal village, where my guide was well-known, having sponsored the son of one family though school, who later became a teacher. Thanks to this bond, we were readily welcomed into the family home where we discovered no less than four women with tattooed faces. They told me how they were tattooed when they were just nine years old, and how it was an ancient custom to do so, in order to prevent invaders from stealing away the local women (dinner and a movie aren’t the norm here for some odd reason). Facial tattooing took a full day to complete. The tattooing took over a day to complete and was extremely painful, especially the tender eyelid area. Each area of Chin state has a distinct tattoo pattern, so it is actually possible to discern where a woman comes from by the pattern on her face. It is this kind of ancillary information that makes so much of what we think we understand about Myanmar’s hill tribes almost irrelevant. This is life. This is their reality. This Chin family readily welcomed me into their home. The practice is no longer permitted by the Burmese authorities, nor is the younger generation interested in partaking in the custom. Therefore, this part of Chin culture will soon be gone, yet I was able to witness the last living generation to embrace this custom. I left feeling very fortunate indeed. Dastkaari Haat Craft Bazaar was hosted at Dilli Haat, New Delhi from January 1 to 15. This is an annual event organized each year by Dastkari Haat Samiti and this year marks the 30th anniversary of the event. India’s Ministry of External Affairs and the Embassy of India in Myanmar support this event to encourage and support the traditional craftsmen from Myanmar and India. It also serves the purpose of bringing these two countries together and enhancing their friendship. Not only do craftsmen get to showcase their work but along with that they also find a great opportunity for networking and learning from each other. 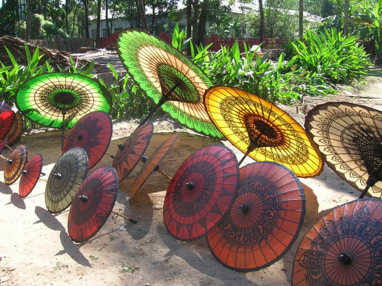 This year, at the 30th Dastkaari Haat Craft Bazaar artisans from Myanmar presented traditional Pathein umbrellas, puppets, velvet slippers, lacquer work and various types of jade items all of which were loved by everyone. Indian craftsmen came from various states and exhibited their traditional skills in their full glory. People who visited the vent got to enjoy various traditional crafts such as shell craft, basketry, mat weaving, handloom textile weaving, hyacinth grass weaving, jewellery and many more. Representatives from exports and handicrafts as well as Foreign Ministry of India were also present and they described this craft bazaar as a beneficial event for everyone involved. A Crafts and Skill Development Workshop was also organized which resulted in the creation of various new, innovative designs. The workshop also provided an additional wonderful opportunity to artisans from both the countries to enhance learn new techniques, improve their skills, build useful links, and form new friendships. One of the main purposes of this event is to provide more opportunities to craftsmen from Myanmar by providing them more exposure and enabling them to make better quality products. Visitors and craftsmen were also treated to a visual and auditory feast by various folk artists. Musical performance by Langa group and Kalbelia gypsy dance from Rajasthan, the Bhavai folk theatre from Gujrat, and the tribal martial Chhau dance from West Bengal won all the hearts. The Human Rights Human Dignity International Film Festival (HRHDIFF) was established in the year 2013 in order to encourage film and documentary makers and to acknowledge and honor excellence in this field. In its inaugural year and the subsequent year 2014 it showcased over 120 films. This year, it has already shown more than 70 films and has also given away awards to talented film makers. 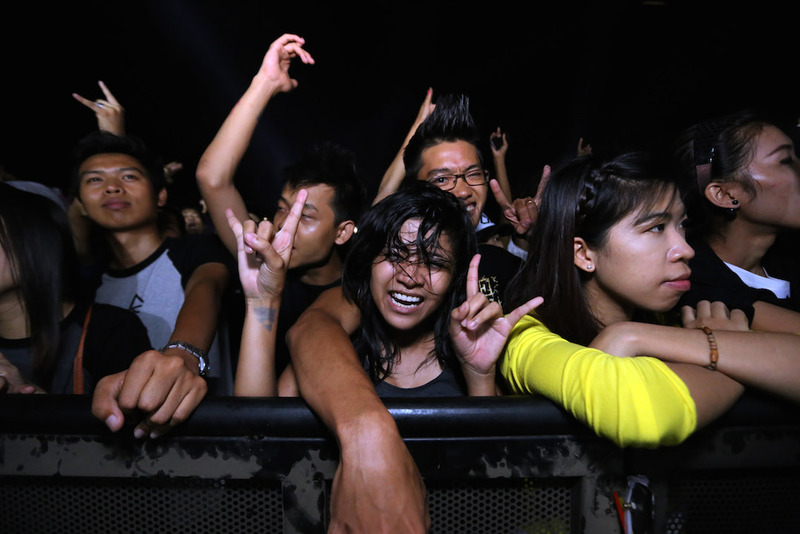 The event was organized from June 15 to June 19 and a total of seven awards were given away. The Aung San Suu Kyi Prize is considered as the most prestigious HRHDIFF award and this year it was awarded to a documentary named ‘Touching the Fire’. This documentary was produced by Human Rights Foundation of Monland (HURFOM) and directed by Min Than Oo. It was one of the 10 documentaries shown at the festival this year and it dealt in-depth with the difference between the opinion of general people and the views of the government with regards to a coal-fired power plant project proposed by a company named Toyo Thai. 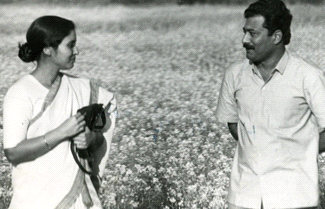 The Assamese film industry was born in the year 1935 with the release of the first film in Assamese language named ‘Joymoti’. The industry has an old history and it has received considerable artistic success as well. However, of late this industry has been seeing a decline as it is finding itself unable to compete with the much larger and grander Bollywood. On June 30, 2015 many of the well-known personalities associated with the Assamese cinema put up a joint front in Guwahati and displayed their resolve to revive Assamese cinema. The participants made clear that this not a protest but rather a constructive exercise to seek out a solution in order to save Assamese cinema. They were happy with the fact that they were all united for the cause and hope to make their beloved film industry self-sufficient with local support. ‘Fragrances of NE’ film fest is being organized by The Directorate of Film Festivals under the Union Ministry of Information & Broadcasting. 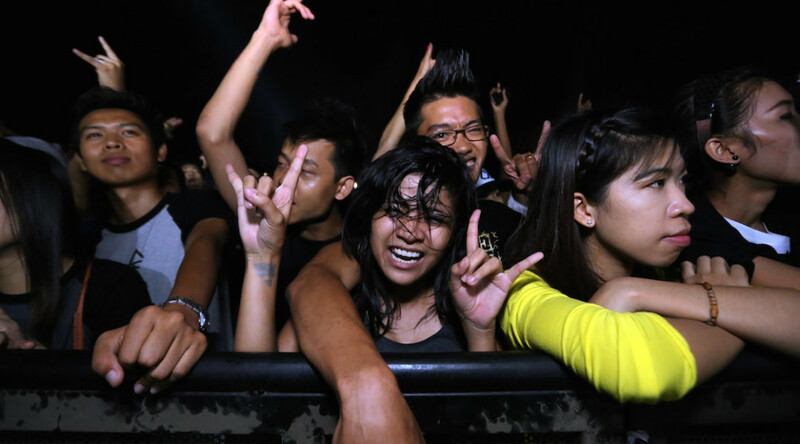 The fest will open in Delhi on August 21 and will continue till August 23. 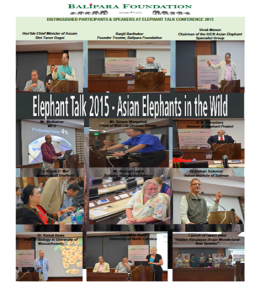 This is the second time that this fest is being organized in Delhi. This year the film fest will open with Manipuri feature film Pallepfam. Six films from Aribam Syam Sharma will be featured as a retrospective of this movie maestro from Manipur. Ko:Yad, Yathawat, Last Rites, Maithya, and Crossing Bridges are some of the other films that will be screened. Naga documentaries “The Honey Hunter And The Maker” and “Story of a House and a bouquet of shorts from Meghalaya – “Karyukai” and “Rong Kuchak” will also be shown. Hindi film “Aisa Yeh Jahaan” will be the closing film of the festival. Preparations are underway for placing Manipuri Dance in the record books. In order to achieve this feat a total of 30,000 dancers will dance together at Palace compound in Imphal East on September 27. This performance will grant this artistic dance form a place in the Guinness Book of World Records. Mr. Leishemba Budha, the chief operating officer of Kangla Entertainment Industry, says that by doing so they are trying to provide a larger platform to the dance form and the dancers who practice it. A total of 100 brand ambassadors have been chosen for the Manipuri dance through a state level competition and they performed together on July 5 as a demonstration of what is to come on September 27. 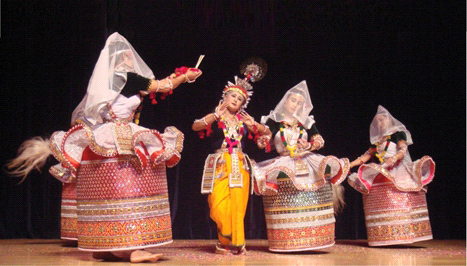 During this performance the dancers danced to a patriotic song ‘Sana Leibak Manipur Koloi Nangi Manipur’ (Resourceful Manipur, thy name is Manipur). Mr. Leishemba Budha, the chief operating officer of Kangla Entertainment Industry says that this song was chosen because not only is it patriotic but along with that its meaning and rhythm also go really well with the Manipuri dance form. In order to obtain the required number of 30,000 dancers The Kangla Entertainment Industry plans to campaign in schools, local clubs, organizations, and dance colleges. 40 dancers will be chosen from the 100 ambassadors by the organizers in order to train interested dancers who want to join the event.